Ease the daily management of the catalog, the orders and the customer service. 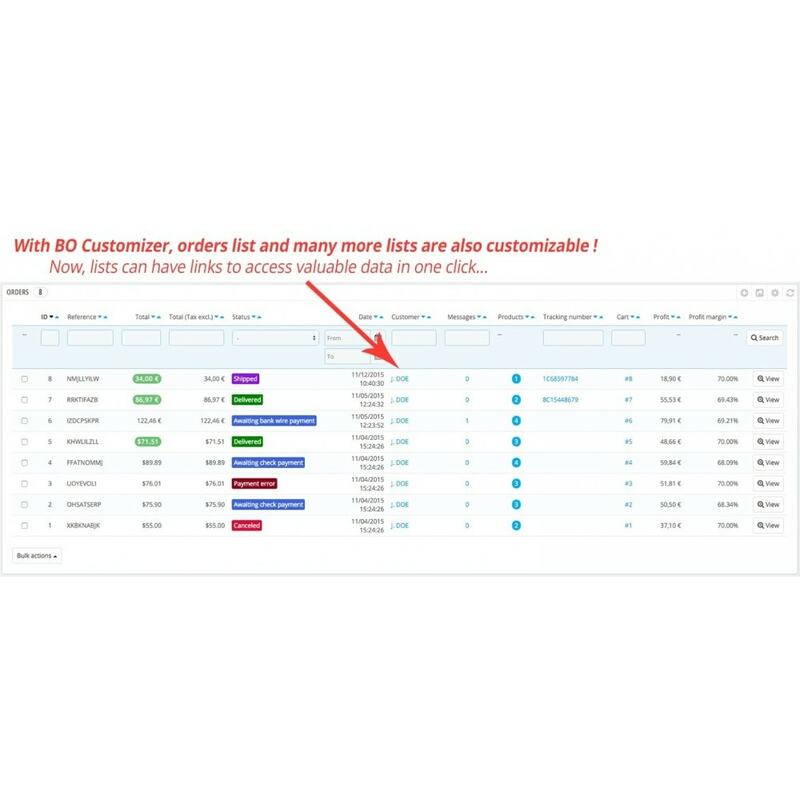 Save time in back-office usage and navigation in your catalog, orders, customer accounts, carts, messages, etc. 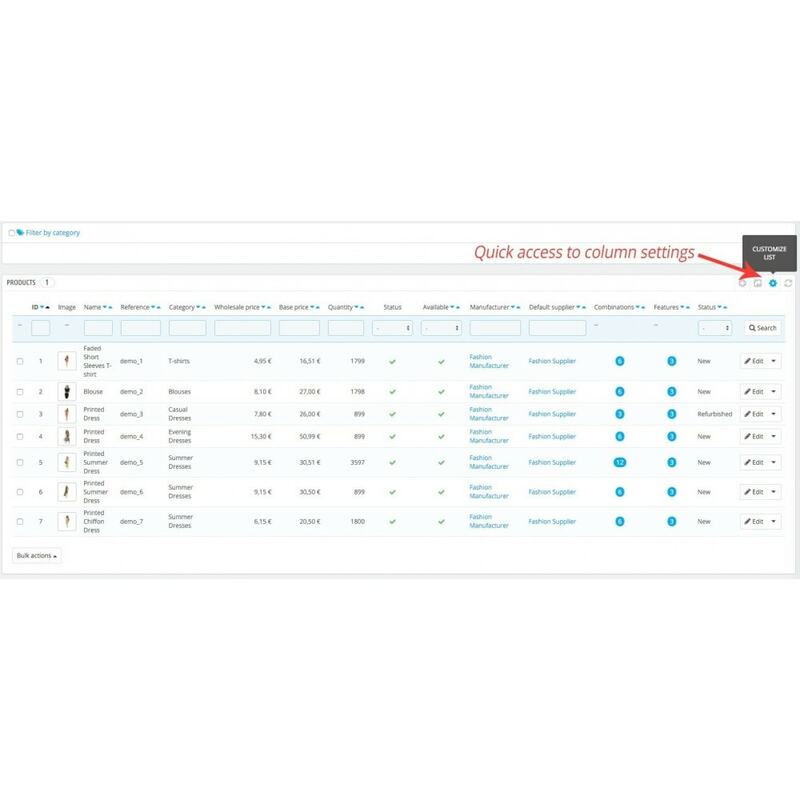 Adapt your back-office to the needs of your activity by selecting the information to display in various listings. Rapidly access relevant information of your shop. By focusing on displaying essential information for your activity and thanks to a direct access to the product, customer or order pages, navigation is greatly facilitated. For example, the tracking number of a delivery can now be directly available in your orders list. Each salesman can thus adapt his display to his needs in order to optimize his organization, his customer service or the management of the products catalog. 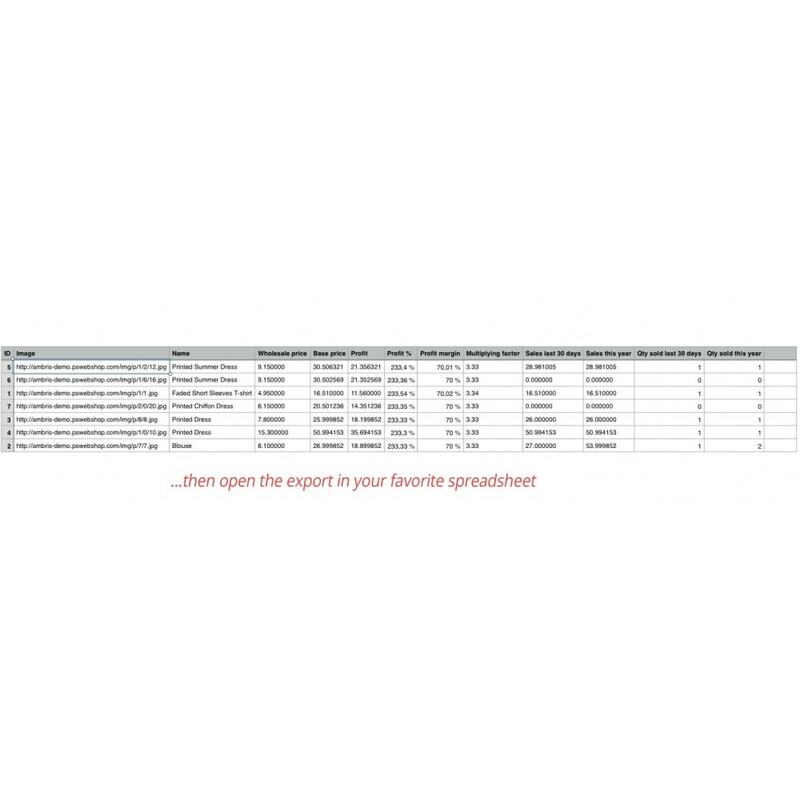 All the information listed can be exported to the CSV format (compatible with Excel) in order to build your own analysises and statistics. 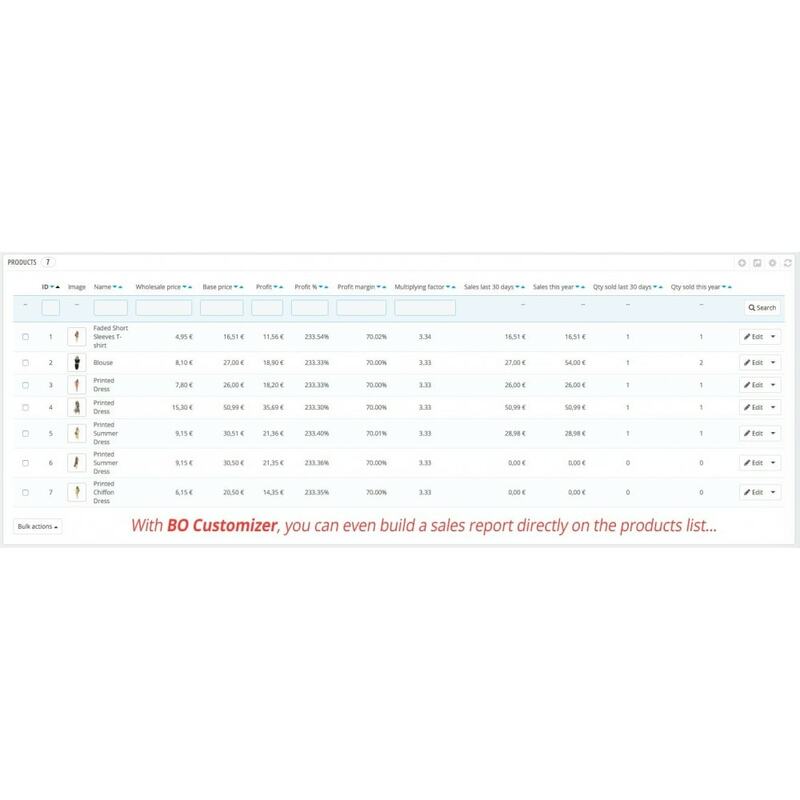 BO Customizer is an easy to use tool enhancing your back-office in order to make it the perfect tool to boost your performances. New version 2.0 now compatible with Prestashop 1.7 ! 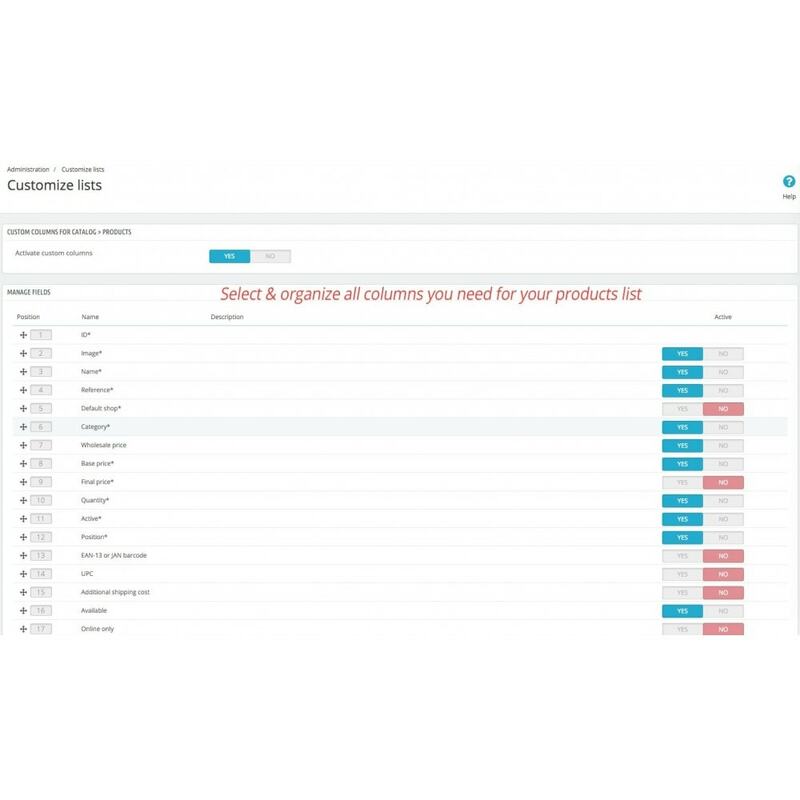 This new version 2.0 add a new products listing that allows you to list and to display many informations about your products on a single page of your backoffice. You can also filter and export them on many criterias. Get the full power on your catalog ! 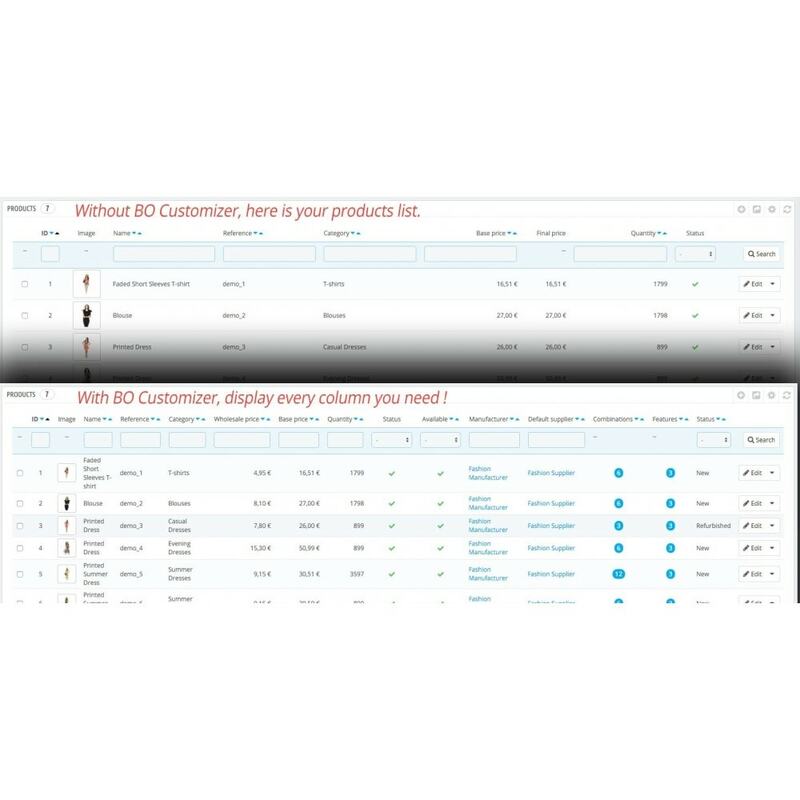 BO Customizer is the most complete solution in order to display informations in the prestashop Back-Office. 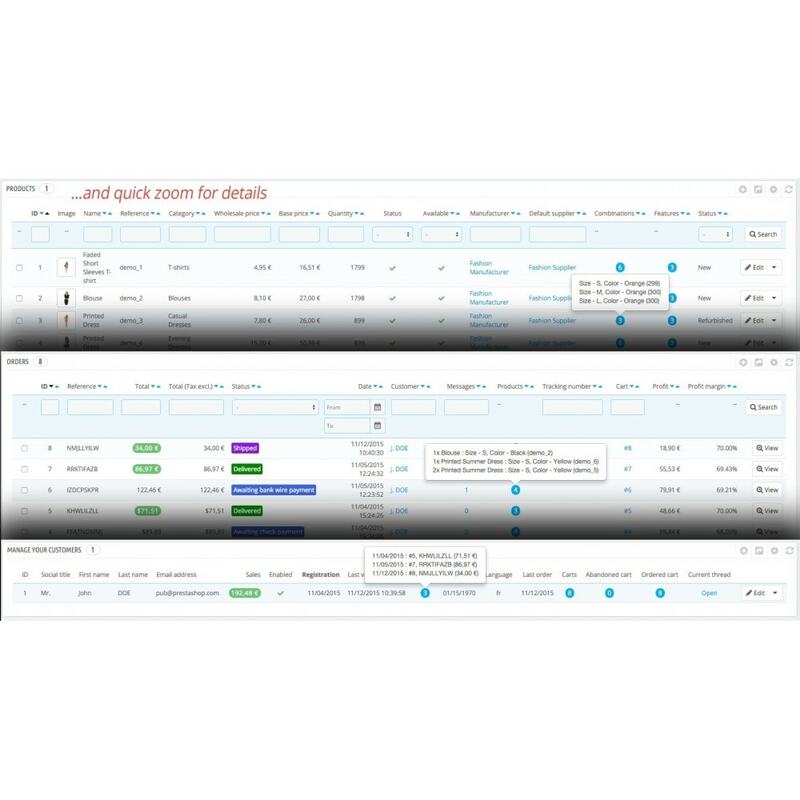 It's a customization and export tool for the existing back-office. Within 2 clics, it is possible to add a column "product state (new / used / reconditioned)" to the products list. The user can then sort or filter on this new column and thus watch his stock of used or reconditioned products. 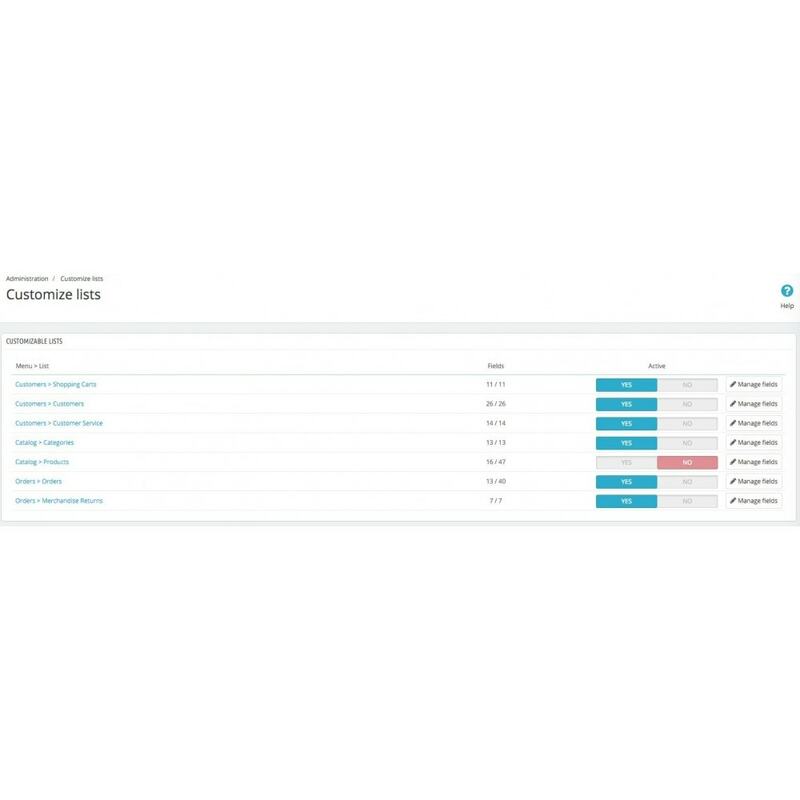 A customer service could customize its lists to display the informations most frequently asked for and answer customer queries without having to navigate through multiple back-office screens. Possibilities are infinite and everyone can adapt their back-office to their own personal needs. Complete customization of products, orders, customers, carts, messages (customer service), categories and merchandise returns lists. All your shop data is availably directly without having to consult the detailled product, order or client page. New search fields to find the informations you need easily. A more efficient customer service, since it is easier to retrieve your customer information. A more up-to-date catalog thanks to a facilitated product management. Depending on your catalog size or your customer and order history, the display of too many columns may harm visibility and response time. Try to always favorise the display of only the most pertinent information for your daily use. Simply use the Prestashop automated installer : Your module is ready to use ! through the menu link "Administration > Customize lists". 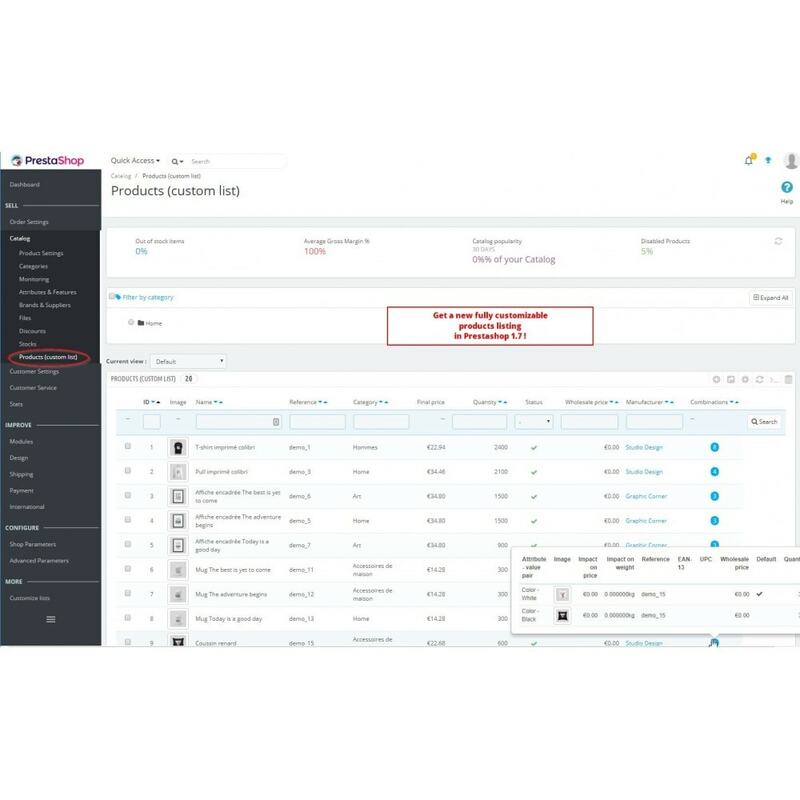 On any of these lists, if the bocustomizer is enabled, it is possible to access directly to the configuration panel by clicking the little "gear" button on the top right of the list.